Exploring Overland will be the North American distributor for the eagerly anticipated fourth edition of the overlanding bible, Tom Sheppard's Vehicle-dependent Expedition Guide. This updated and expanded edition is co-authored by Jonathan Hanson, and includes more information relevant to North American travelers. Sales will commence in May 2015. Please fill out THIS FORM if you wish to be notified when it is available for purchase. OT&T is our active weblog of in-depth overland equipment tests, reviews, news, travel tips, & stories from the best overlanding experts on the planet, all curated by Jonathan Hanson. You can download the digital version, which includes hotlinks for websites and email contacts. We recommend viewing the PDF on computers or iPads. (GoodReader is an excellent PDF reader app for iPad.) CLICK HERE FOR DOWNLOAD. You can order a print copy at cost ($15) from conserventures.magcloud.com. 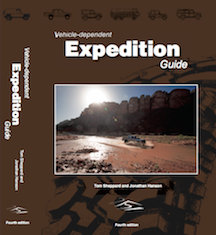 We're proud to announce our Overland Sourcebook, the annual companion to Overland Expo and your year-round go-to resource. The Sourcebook is the guide to the overlanding industry with 70 pages of listings for all things adventure: vehicles, motorcycles, accessories, camping equipment, services, information, trip planning, business consultants, fabricators, and much more. Listings include Exhibitor booth numbers and a map. Overland Experience attendees & exhibitors get one in their goody bags.